Category: Creative Writing | Comments Off on NaNoWriMo Again? The Plan™ was to edit my NaNoWriMo draft in March. I got as far as printing it out and putting it in a binder along with red and black pens for notes. I expected to have problems editing, which is why I printed the draft. I figured it would be easier to get done if there was a physical reminder on my desk. The binder did a great job reminding me I should be editing whenever I was at my desk, but what I didn’t realize was how much emotional inertia I had. Finishing NaNo last year is something I’m super proud of. I start a lot of creative projects and rarely finish any of them. So hitting the 50,000 word goal and finishing a story felt really good. So good that I’m finding myself reluctant to pick it up and read through. I know it needs a lot of work, I remember thinking that while writing, but somehow it feels as though sitting down and reading it will make the work more real and will also diminish the accomplishment from November. Which is a stupid way to feel, but that doesn’t make it an easier to shake. All that said I’m not giving up on this particular story yet, but I do need to figure out a better way of scheduling editing time and motivating myself. After two failed attempts, one serious and one not so serious, I’ve finally won November! Of course anyone who’s stopped by already knows from the NaNoWriMo widget on the right. Ironically it’s taken me until the end of December to actually write about it, some things never change. I learned a few things this year. First I’m actually capable of focusing on and finishing a novel, which is something I wasn’t entirely sure I could do. I managed it this year by setting a reminder on my phone and basically blocking out 9 to 11 pm every night to write. No books or games until I’d gotten to my 1667 word goal for the evening. I also helped myself out by starting at 12:01 am on November first and getting a few hundred words in early so that when I sat down that night I could take it a little easy and still finish ahead by more than 300 words. The first week went very well especially the first few days where I got ahead by 1788 words, it felt pretty good knowing I could take a whole day off and still be on track. Instead, I ended up using up that buffer a little bit at a time during the second week which was by far the toughest for me of the month. Hanging in during the rough week two was the first time creative writing ever felt like work to me. I found myself checking my word count after every sentence and taking too frequent breaks to research things like quarterstaves and ferrules. I got through it though motivated in large part by watching Belghast and Mogsy zip through their word counts. The second two weeks were easier although not easy. I realized at some point that writing was a lot like backpacking. An overnight backpacking trip is fun before you start out and after you reach the top of the mountain, but the in between part can be pretty painful, which is of course why reaching the top feels so good. Writing is very much the same, some nights it was tediously painful trying to follow one word with another, but then I’d get to a level patch or hit a peak and the words would tumble out as fast as I could type them. I also got surprised a few times by things my characters did, which was a novel (pun intended) experience and absolutely fun to have happen. So I finished a day early on the 29th with 50,029 words. Even better I managed to beat my daily 1667 word goal for 23 out of 30 days. The next big question is of course what do I do with it now? I’ve been thinking about it over December, we’ll pretend that’s why I left the writeup for the 31st. Originally I was thinking I’d just leave it as background and exploratory writing for the setting I’ve been working in. But I’ve changed my mind on that. I found out during November that I was much more productive if I had a rough outline of where the story should go next. I didn’t always follow the outline, but it did always make the evening’s writing easier. If nothing else I think it would just get my mental gears shifted and warmed up a few hours early. So instead of dropping it or just using it to help fill out the setting, in March I’m going to take it and make an outline of the current draft and then spend a few weeks editing it to see how it can be improved. I know there’s a lot that needs to be done, the framing story linking the individual flashbacks together is very thin and doesn’t really have a resolution to it. Some of the flashbacks need to be fleshed out a bit more as well and there’s one that has a lot of exposition in it that needs to be trimmed out. Still, if nothing else, it will be good practice for me for picking up my unfinished NaNoWriMo draft from 2010, which is something I actually would eventually like to publish. It’s November, which means National Novel Writing Month. I’ve tried twice now in 2009 and 2010. In 2009 I didn’t really approach it seriously. I started late, had no idea what I was going to write, and didn’t dedicate much time to it. I think that was around when Arkham Asylum came out and I spent my free time playing that instead. In 2010, I decided I was going to make a serious attempt and did much better, but still only finished about halfway to the goal. I skipped the next two years. It felt stupid to start another new story when I still had a half written one that I kept planning to get back to sometime. This year I’m giving it another try. I wanted to join in the social experience and I decided what I could do was write another story set in the Pellia setting I developed during my 2010 attempt. It would be a way to flesh out the world some more and give me a chance to try an re-establish some good writing habits, possibly even get me to pick up the writing on The Unlucky Thief after November’s insanity has passed. So I’m writing A Wizard’s Life. I have it planned out as an aging wizard telling his grandson about his life in five short stories, hopefully totalling 50,000 words. 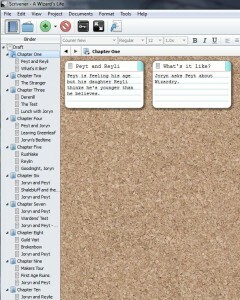 I’m hoping breaking it up into smaller individual stories will help me with plotting. To hit 50,000 words in a month, I have to get roughly 1,667 down per day. I managed 1,998 on the 1st so I’m feeling pretty good at the start. National Novel Writing Month is over. My final word count was 22,346 words. I’m now 0 for 2 on NaNoWriMo attempts, but I couldn’t be happier with how November turned out. So why am I so pleased if I didn’t win? I learned a lot this year about what writing processes work for me. I know how many words I can do comfortably in an hour (about 500 once I get warmed up). I’ve gotten my fiction writing mental-muscles back in shape. 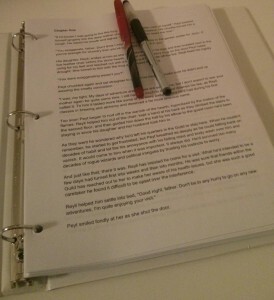 I’ve learned how to shut off my inner editor and accepted that the first draft doesn’t have to be perfect. I’ve developed a writing support network. I’m definitely planning on trying against next year. In general, I have between three and four hours a day for hobbies. That’s anything that’s not work or parenting related, which covers writing, reading, playing games, and watching TV. With an average of 500 words an hour, the best I can expect to do in a day is 2,000 words. Hopefully as I continue to write my average will go up, but assuming it doesn’t, I’ll need to be more consistent about WriMo next year if I want to win. If I can stay on schedule most days or stay within a few hundred words, I should be able to do it. This year, I was pretty much behind from the start. I was better prepared than last year (not hard to do since I’d done no preparation), but I hadn’t expected to have so much trouble with the basic mechanics of fiction writing. For me, it’s a different set of mental gears than what I sue for blogging, and they were pretty rusty. Fortunately by week two I was getting into a good flow more quickly, but by then I was much too far behind to really catchup. Slacking off in week three didn’t help either. Besides just the different mechanics of creative fiction writing, learning to recognize and combat some of my bad habits has been a real break-through. I always want the worlds my stories take place in to have depth and character. To accomplish that, I spend a lot of time coming with the history pf the world. Usually I spend so long on this that I never end up writing my original story idea. Doing WriMo has helped me learn to recognize and ignore that impulse. Now I’m able to just focus on getting the story down, leaving myself notes in square brackets as needed. I had a major test of my ability to ignore my inner editor just yesterday. I was writing a major scene that I didn’t have a clear mental picture of. I knew as I was writing it that it was not good, but I forced myself to continue writing, to not stop and look at what was on the screen. Eventually the scene became clearer me and I left some notes to myself for when I come back for the first rewrite, but I kept moving forward and that was the important part. Having a writing support group isn’t something I’d ever given much thought too. I was really surprised about how good some of the feedback was that I got earlier in the month when I posted about messing up a scene and having to backup a bit. I’d really just posted it because I thought it was funny, but I got some excellent ideas from reader comments. Twitter has also been a good source of encouragement, enough that a group of us are forming a writer’s group to help provide critical feedback on projects. I’m very excited to see how much more I can learn from sharing my writing with the group and reading others. All in all, NaNoWriMo has been an excellent experience this year. I’m not planning to stop though. I’m going to continue writing, and I’m setting a daily goal of 600 words for December. I intend to increase that in January, but I’m taking it easy for December. It’s the 15th already. Time is really flying by on me, even faster than I expected it to. I’m currently at 15,619 words. By the schedule I should be at 25,005 words. You can do the math if you want to see how far behind that makes me, it’s probably not healthy for me to know. Anyway…. I may (probably) not hit 50,000 by the end of the month, the NaNoWriMo site tells me I’ll be done by December 21st at my current pace. I’m honestly not too upset about it. I’ve already done better than I hoped, and the story I’m working on has started to come alive on me. Plot problems that I wasn’t sure how to deal with have suggested solutions as I got near them. Dialog has been flowing pretty easily. Regardless of my word count on the 30th, I’m planning to keep plugging away at it until it’s done. The two biggest lessons I’ve learned: spend a little time writing whenever I can and don’t over plan. Over planning has always been my biggest hurdle. My inclination is to write fantasy, and I’m always especially interested in the world building (probably my frustrated Dungeon Master side). The problem is, that my initial bout of creativity is always spent on the setting. Often I never even get to the story. This month has already shown me, that what I really need to do is sit down and start writing. I don’t need to have the world completely realized to do the first draft, and it’s actually better if I don’t.